Not everyone has a big back yard to transform into a summer garden. But most garden vegetables don't demand 40 acres to produce luscious crops — they just need appropriate soil and plenty of sunshine. Even apartment dwellers longing for sun-ripened veggies can probably find a bright location to make a container garden. 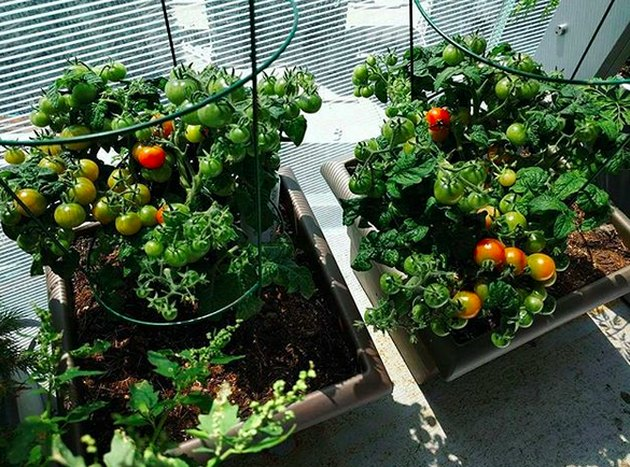 Read on to learn how to create a balcony garden where you can grow easy vegetables like tomatoes, peppers, and squash. It goes without saying that the size of pots and types of soil are just as important as the plants you decide to grow in a balcony garden. Assess your space to determine what is possible. Ideally, all containers should be at least 12 inches in diameter. Don't limit your garden to floor pots. If your balcony will accommodate hanging planters, that can work well for smaller or lighter vegetables like cherry tomatoes or peppers. Almost all garden veggies prefer organically rich, well-draining soil. Garden soil is too heavy, so it's best to purchase a potting mix that contains some organic compost. 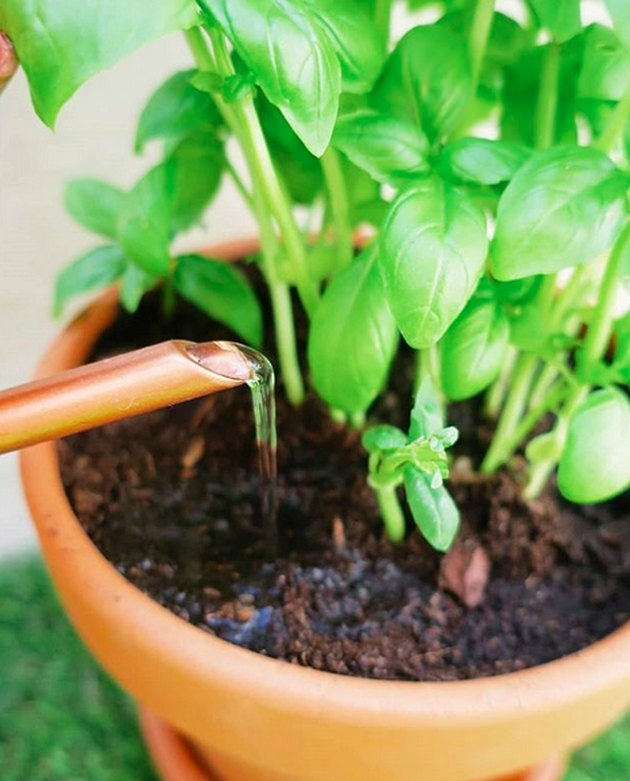 Don't forget that all garden containers must have ample drainage holes that allow extra water to drip out. Nothing says summer like tomatoes ripening on the vine. But mature tomato plants are huge and require big root systems to support their size and weight. This means big pots, at least 18 to 20 inches in diameter. If you have room for this size containers on your balcony, pick any kind of determinate tomato transplant. These are the shorter, bush-style tomato plants (around 3 feet tall) rather than tomato plants that grow on a vine. Good ones to consider include compact 'Celebrity' or 'Rutgers.' Even bush tomatoes require staking or caging however, so you might be better off with varieties made for containers, like "Better Bush" or "Patio" cultivars. Another option is to grow cherry tomatoes in hanging baskets. These tomatoes ripen much faster than regular varieties so you won't have to wait as long for a crop. Here's all you need to know about How to Grow Tomatoes in Containers. If you've ever seen bean plants in a neighbor's garden, you would be justified in thinking they need lots of room. 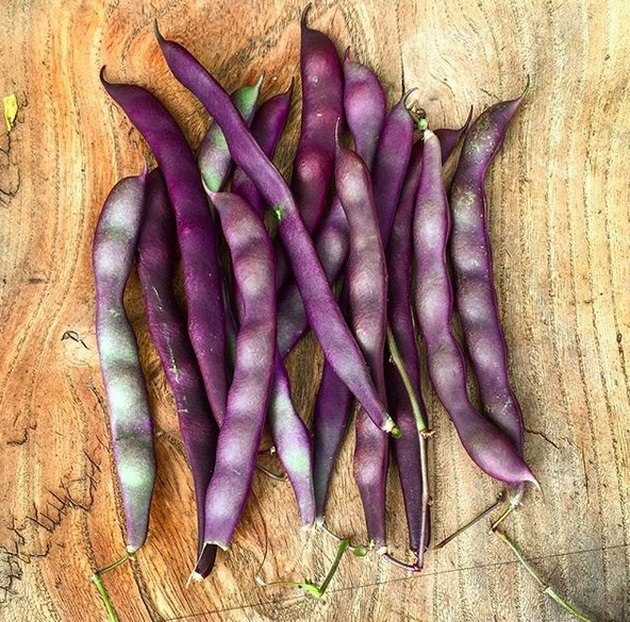 Bush beans can easily occupy an entire garden. However, pole beans grow vertically rather than horizontally. That makes them perfect for a sunny corner in a balcony garden. Pole bean plants grow in a container but they shoot up like vines. As each plant grows taller, it requires the support of a trellis. You can go as fancy or as simple as you like with the trellis. Even a homemade framework of bamboo poles holding vertical lengths of heavy cord works fine. The vines climb the cords to the top of the trellis. Try 'Trinofo Violeto' or 'Purple King' cultivars for gorgeous plants that produce all summer long. Here's all you need to know about How to Grow Pole Beans in Containers. Peppers are such a diverse group that you can plant a handful of different species for different looks and flavors. Sweet peppers can be red, yellow, or orange and work well in salads or stuffed. Hot peppers can be colorful and add punch to a meal, especially ethnic cooking. 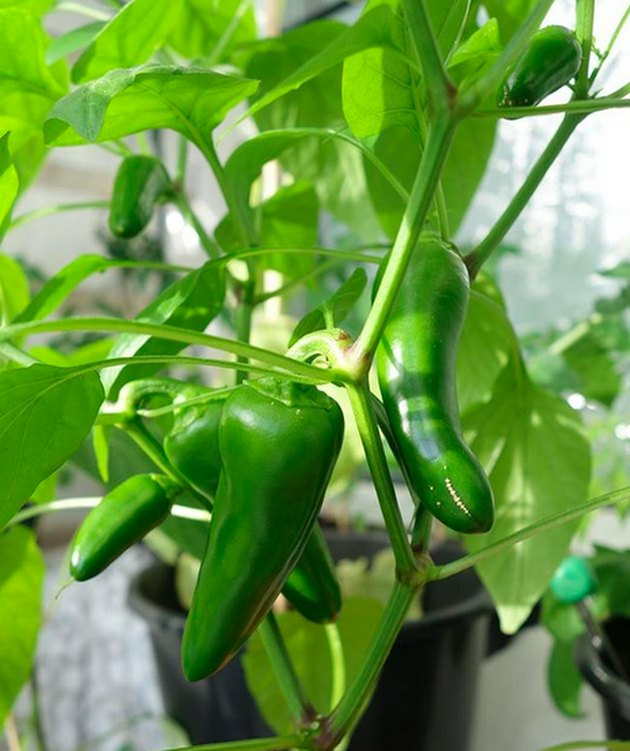 Peppers can be round, elongated, or oval, big or small, and they are small enough to grow happily in containers. A plus: they don't need as much water as tomatoes. Here's everything you need to know about How to Grow Peppers in Containers. Lettuce and other green leafy veggies like kale, spinach, arugula, and chard are cool season vegetables. That means they will grow best before or after the hottest part of the summer, but they bolt as the heat goes up. 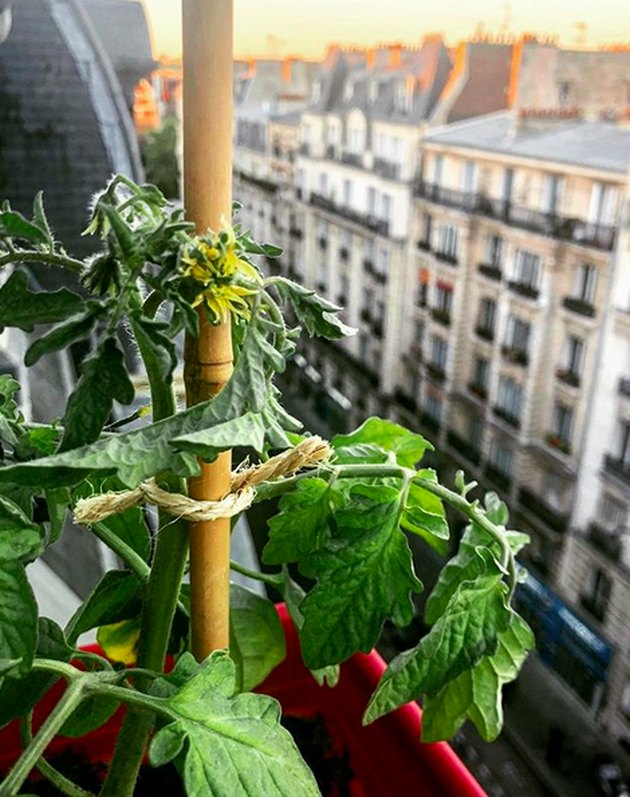 Why add them to a balcony garden? Because they are the perfect size for container growing and you can pick individual leaves when you need them. If your area has cooler summers, you may be able to harvest lettuce or spinach from spring straight through fall. 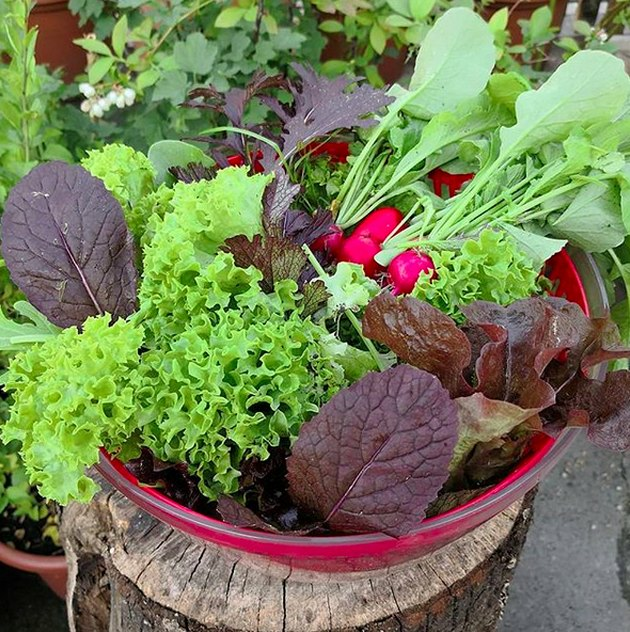 Here's everything you need to know about How to Grow Lettuce and Other Leafy Greens in Containers. Okay, so herbs aren't vegetables, but they grow so happily in containers. Most herbs require sun and well-draining soil, just like summer vegetables. Basil, thyme, mint, parsley, sage — all of your favorites are candidates for a balcony container garden. Note that some (basil) like water, while others (like sage) need to dry out thoroughly between drinks. 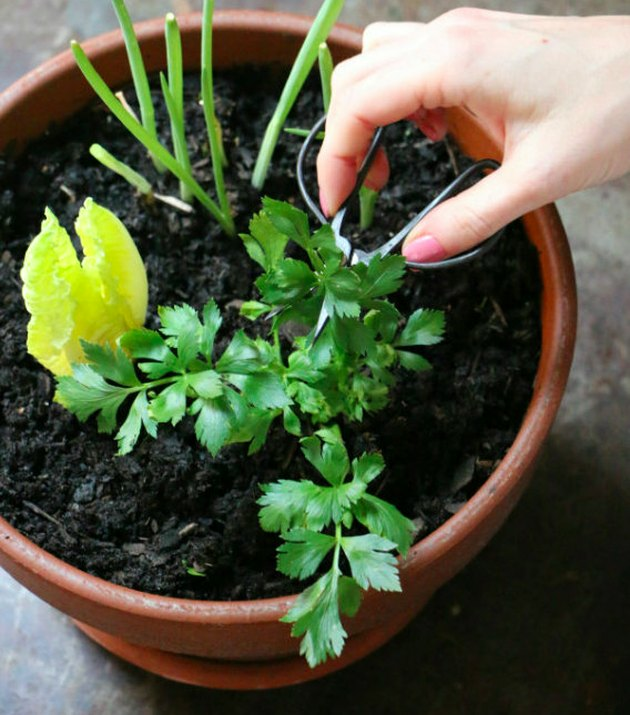 Pick herbs regularly to keep them actively growing. Here's everything you need to know about How to Grow an Herb and Spice Garden in Containers.